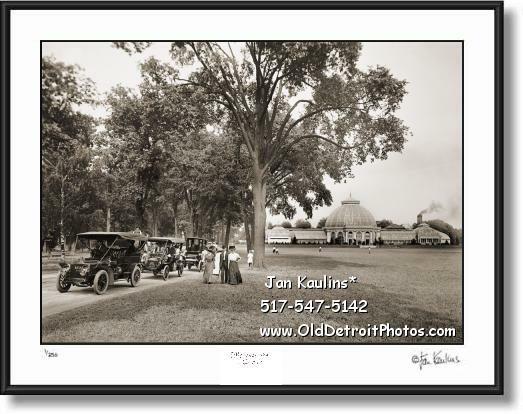 OLD BELLE ISLE CONSERVATORY 1910 photo picture print photograph for sale. This is a wonderful sepia toned old vintage DETROIT BELLE ISLE CONSERVATORY photo picture print for sale from about 1910. The the left of this BELLE ISLE CONSERVATORY old photo we see a row of very old vintage automobiles with passengers and strollers wearing the finest suites and full length flowing dresses and hats---an excellent 'period' photo. Photos of Belle Isle from this era are quite uncommon. This is an excellent example made from the professionally restored Original black and white negative/photo.